Saturday, May 19, 2012, 1:00-4:00 p.m.
Download the Good Neighbor Block Party Invite Poster! Entertainment, live music, barbecue, beverages, tabling, kids activities, movies, education, fun, networking, and best of all–GREAT NEIGHBORS! Everyone is invited. Plus an award ceremony to honor local foreclosure fighters + activists. Celebrate the successful actions that have helped keep neighbors in their homes. We’ll acknowledge the miraculous work being done to stop foreclosures. Mingle with people who care about people. We’re also seeking volunteers to help on the day of the event. Join us for a production meeting Friday night, May 18, 6-8 at Progressive Grounds. Or just come! 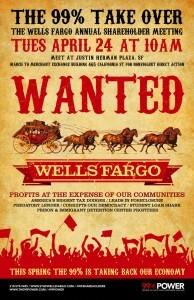 Protest the Wells Fargo Shareholders’ Meeting on Tuesday, April 24, 2012.
homeowners from mortgage fraud and abuse. $26 billion multistate settlement with big banks over foreclosure abuses. special grand jury to investigate financial and foreclosure crime. recording a notice of default. time of the filing of a notice of default. after another loss mitigation measure has been approved. modification or other loss mitigation measure has been denied. including notices of foreclosure sale postponement. to the accuracy of the document or statement. being made to the property. the work of the Mortgage Fraud Strike Force. The South Bay communities of Hillsborough and Los Altos are seemingly safe, full of large, idyllic homes for the 1 percent. But community predators lurk among them. 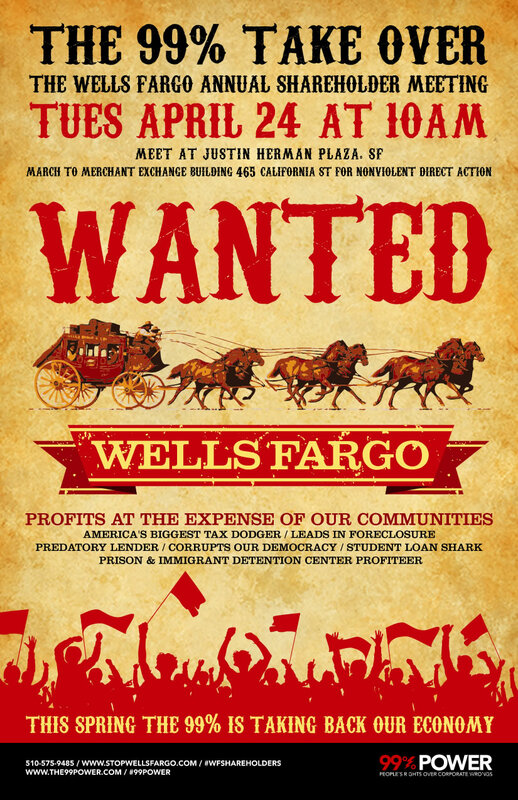 Nicholas G. Moore and Philip J. Quigley both sit on the board of Wells Fargo. They are still at large, living in luxury while they continue to steal our neighbors’ homes and prey on our communities. Foreclosure fighters, neighbors and activists have been demanding loan modifications, but our cries have fallen on deaf ears. Earlier in March, Dexter Cato even re-occupied his home in Bayview/Hunters-Point, but Wells Fargo still refuses to negotiate a loan modification in good faith. On April 7, we will be bringing the crimes of Moore, Quigley and the rest of the Wells Fargo community predators to the light of day. Join us as we visit their houses and demand that they stop foreclosing on ours. Come demand loan modifications that will allow all of our neighbors to stay in their homes! Please RSVP to julienball@hotmail.com to reserve a seat on the bus, or call 415-483-9138. Sponsored by Alliance of Californians for Community Empowerment (ACCE) and Occupy Bernal. In the meantime you can Watch the video and read a report from last week’s meeting. Stick together and please attend! Mission Economic Development Agency is hosting a monthly Foreclosure Intervention & Mortgage Default Workshop. Keep in mind you can come as an organizer, activist, citizen, homeowner, be informed and later disseminate & pass on the info to the rest of our community. Need a sitter? : No problem! We have child care for the duration, please register in advance to save a spot. If you are a distressed homeowner seeking counseling, please pre-register or come early to fill out needed intake forms to get you assigned. All our services are free of charge to you, for you and because of you. General overview of foreclosure, options, programs, referrals, internal cross services, options, more options and some options. Remember you don’t have to be a homeowner to come, the information will make you a future well informed homeowner/ advocate!! !